I have written a lot about pills over the years and many of the posts feature my favourite cartoon character, “Pilly Galore”. (You can see all my earlier blogs on this subject by clicking on “PILLS” in the TAG CLOUD). Pilly would be most dismayed by the latest dust-up between the NHS and pharmacists. Dr Keith Ridge, the Chief Pharmacist for NHS England, is trying to cut down on the billions of pills older people take each year. Pilly would not like that at all, since she measures the state of her ill-health by the number of pills she takes each day. The more the better……..or should it be the more the iller! Either way her favourite GP, Dr Astroglax, keeps prescribing them for her, so she must need them. Dr Ridge says “older people are taking too many pointless pills and it’s a scandal”. He has found that “one in seven hospital admissions in the over 75’s, was the result of a drug problem” and that “20% of medicines were unnecessary and half were not taken properly”. His solution is to urge pharmacists to sell less pills! Which seems to me to be rather wishful thinking. I agree with most of what he says about the problem, it certainly reflects my experience of running nursing homes for many years and seeing just how many pills people take. But Dr Ridge is clearly no businessman and is unlikely to succeed up against the massive advertising and promotion budgets of the drug companies. His main target should be the GP’s who prescribe the pills in the first place. Here’s how Doctor Astroglax goes about his daily job. Firstly a pill to cure the ailment their patient presents to them, …..then later another pill to cure the side effects of the first pill, ….then more problems, ……then more pills. All free to older people. What would be ideal to save GP’s and pharmacists time with all that prescribing and prescriptions, would be one big ‘cure-all pill’. Perhaps a better answer would be to charge patients for pills? But I can’t see Pilly ever agreeing to that. This entry was posted in N.H.S. and tagged "Pills". Bookmark the permalink. Thanks George that’s a very good point you make, The health agenda is set by and led by the medical profession and consequently the focus is on illness. We don’t have a wellness service we have an illness service. If we individually and as a society made more effort to stay fit and healthy, we would have less need for pills to cure ills. I am here! like a bad penny and a smell under the nose?? I must be wary of tom’s cartoon on this blog? My mischievous nautical seagoing humour does me no favours? 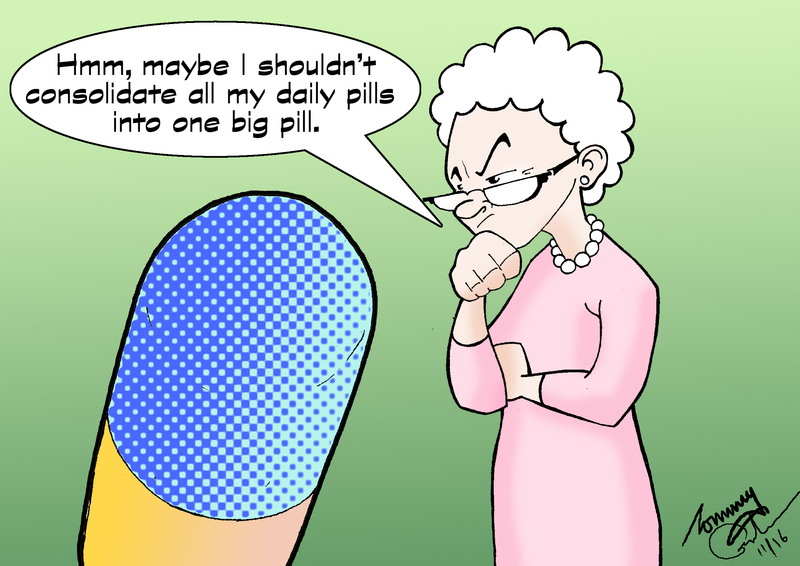 My image from looking at the cartoon on the blog, is ‘Pilly galore’,is not admiring a pill of sorts but a ‘Phallic symbol’ and being metophorically ”stuffed” to put it into polite language. What is that item in Georges and Walts book the f—-t list???? This weekends papers, Daily Telegraph, has had some food for thought, for us older folk. 14/15 Jan 2017. Saturdays edition amongst its sprawl had a section (Or was it the Daily mail on Friday 13 01 2017) about the CPS and the legal procedures, over assisted suicides in certain cases? I uphold the view life is sacrosanct, and we all have both a duty and a moral obligation to protect and preserve life! I also am open to compassionate and deeply held views on suffering, and would wish to see a more open society, but deeply compassionate discuss death and suffering and all that may involve from a personal and a clinical viewpoint within a a close family unit or social group, with out political and religious dogma dictating terms. At the end of the day ones soul has to respond as ones conscious does, to a court a a jury of at least 11 fair minded citezens, and their verdict: WE how ever must be able to provide the best outlook for our loved ones what ever the prognosis or future, with a self a clear conscious but maybe a broken heart at any decision reach. This is the clarion call back to cottage hospitals and the redefinition and duties of what are now termed “” Care Home””(s) and all that implies within the care industry for those that need care whether they be elderly or just ill (mentally or physically). It is a mind field?? Under Tony Blair and Gordon Brown, we were persuaded to centralise all hospital treatments into a single local point of contact, and that each of these ginormous hospitals them selves would specialise and become national centres of excellence? We must now as the future generation pay for this investment (Foot the BILL), and today while we bellyache we must come to terms with the human costs of what our own society are composed off?? The Elderly?? we need care in the home? Do we, or are we looking for never-never land and Peter Pan?? How do we square the circle??? Answers on a postcard please!!! It will take an awful lot of post cards to resolve the shortfalls in NHS hospitals in relation to care of the elderly. It goes back to George’s point, we have led people to believe the health service can cure all ills and with improvements in treatments over the years we have reinforced that idea. Pilly Galore and all her pills are living proof of that. Unfortunately that has removed responsibility for people to look after themselves. I am noting John’s comments, and,antidotal evidence from my peers, would appear to suggest, that the first line of treatment when visiting a GP Doctor, is some magic potion or solution, unless there is an obvious medical organ surgery that can solve the problem. Keeping fit and a healthy diet, especially for the elderly is all good practise, and helps prolongs life. I have difficulty with the comments made by George, and the as mentioned website and book, on the physiological beliefs and listings of ailments that appear to be generated or cured/alleviated by the international drug industry. I found scan reading the suggested blog that the language used and the apparent ease with which all drug remedies are categorised to simplify some very complex subjects (medically and physiologically), difficult to understand, from either the drug industry solution, or the medical profession in its definition of an ailment. I remain sceptical as to how society solves these problems? Doctors and medical practitioners in both the medical profession and drug industry are entitled to earn a living with their specialised knowledge, how ever provided they do it with humility and not as ”gods” then I wish to encourage their beliefs in protecting life. Gently reflecting, on loneliness, I personally go back to my days (Working), when in the marine industry, I was requested and expected to travel, on a worldwide basis, but mainly within what was then western Europe. In or during my working hours I was frequently dealing with English speaking (UK) based personnel. After work, and back to the hotel, was a different kettle of fish. One would enjoy the hotel services, and restaurant, may be the bar? What then a conversation with whom, as all the travellers/guest and locals spoke in various languages. This is challenging and educational, dangerous, and troublesome, as all I wished for was chatter, jokes/patter from a fellow UK/Irish voice passing away time, and not disappearing into the business of the day. So What I am saying even when young one can be lonely even in a room full of people (Strangers), and as I reach old age this still applies, but now the company is English speaking, and yet that siren voice still calls!! Now I exchange life experiences to anyone who will listen, I am but an old bag of wind? But as my mirror tells me! a good looking one?? Loneliness can strike anyone at any time,- be a friendly ear from time to time? listen say nought?